NTU INSIGHT Center organized the “1st International Sleep Technology Symposium” on September 3rd, 2010. It encompassed the changes in sleep patterns of the elderly as well as innovative and applied service models on related sleep technology. The president of this conference Dr. Rayleigh Ping-Ying Chiang and the organizing committee invited 10 domestic and foreign experts and scholars share their latest research results about different aspects of sleep technology with participants. These scholars include: Prof. Christian Guilleminault, the director of the Sleep Disorders Clinic and Research Center at Stanford University; Prof. MichaelV. Vitiello, the director of the Center for Research on Management of Sleep Disorders (CRMSD) at University of Washington; Dr. Kannan Ramar in Mayo Clinic; Prof. Bing-Jyun Wang at the department of information management in Yuan-Ze University; Prof. Chien-Ming Yang at the department of psychology in National Chengchi University; Prof. Ling-Ling Tsai at the department of psychology in National Chung Cheng University; Dr. Ning-Hung Chen, the chief physician of sleep center in Chang Gung Hospital; Dr. Hsin-Ching Lin from the department of otolaryngology in Chang Gung Memorial Hospital in Kaohsiung. In addition, a number of important units in Taiwan co-organized the symposium, including Taiwan Society of Sleep Medicine, Taiwanese Psychology Association, Taiwan Association of Clinical Psychology, Taiwan Counseling Psychology Association, Association of Taiwan Clinical Psychologists, Taipei Association of Clinical Psychologists, Taiwan Association of Gerontology and Geriatrics, Taiwan Smart Living Space Association, Intelligence Living Space (ILS), all made this symposium more fascinating. The agenda of this symposium was really rich and wonderful. This symposium was kicked off by three masters' presentations. 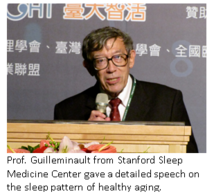 At the beginning, Prof. Guilleminault who is a significant contributor to the field of sleep in the world, gave a detailed introduction on the sleep pattern of healthy aging. 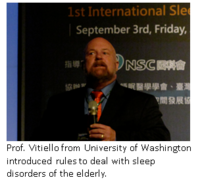 Then, Prof. Vitiello from University of Washington, Seattle, introduced some appropriate rules to deal with sleep disorders of the elderly. 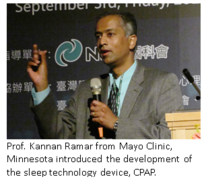 Finally, Dr. Ramar from Mayo Clinic, Minnesota, introduced the development of the sleep technology device, Continuous Positive Airway Pressure (CPAP), to the participants. Now the CPAP is common in hospital sleep centers, and primarily used for treatment of sleep related breathing disorders. The sessions in the afternoon, Dr. Ning-Hung Chen and Hsin-Ching Lin gave further explanations on the diagnosis and treatment of Sleep Apnea. These knowledge accumulated in the field of sleep studies will be able to create a new direction on sleep technology; in addition, there are several new knowledge with commercial potential be launched in this symposium, for example, Prof. Chien-Ming Yang introduced the light therapy as well as Prof. Ling-Ling Tsai mentioned the concept of pillow selection strategy, all refreshing and new to the participants. In the end, Prof. Bing-Jyun Wang was invited to give industrial analyses on the field of sleep technology and present the possible direction of future development (for example, the feasibility of combining the medical tourism industry). Furthermore, his penetrating analyses made those who participated in this symposium feel really useful and helpful. In addition to the sharing of domestic and foreign masters, the other side of the chamber displayed the latest sleep technology products, among them, the “Sleep Coach” and brain rehabilitation software created by NTU INSIGHT called into the attention of many participants and generated a lot of discussion in depth. The 1st International Sleep Technology Symposium tried hard to combine the related personnel in the field of sleep medicine and sleep technology, and looked forward to inspire better quality of sleep technology through the sharing on knowledge and related technology products. On the other hand, the symposium also brought in the concept of healthy aging. Hopefully it will help identify useful phenomenon and develop related sleep technology devices in the near future, and help seniors get back more comfortable sleep quality. If you did not attend such a fascinating symposium, please look forward to related activities held by NTU INSIGHT afterwards, especially the 2nd International Sleep Technology Symposium in Taipei in October 2011, which will make you gain as full!